I was driving into the city last week and I saw a huge grass fire along the side of the highway, blowing smoke into the road and causing very bad visibility for the drivers on the road. I was quite surprised to see a police truck parked on the side of the road, lights flashing and a uniformed policeman walking up taking photos of the fire and the people who had set it. I felt like stopping and shaking his hand. I don’t know what progressed after that but I can only assume he was taking the photos as evidence. I hope the people who set the fire were charged. I realize that it is an age old practice but it is one that has to change. Times and the world has changed and people need to learn to change with it. So, bravo Mr. Policeman, I just hope that something came out of it since so often these things are just completely ignored. 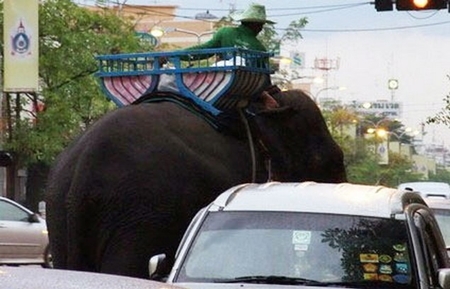 There is a drive to ban elephants from streets all over Thailand started by Friends of the Asian Elephant. We in Chiang Mai are quite lucky that our previous Governor banned them from our streets. I recall the first time I saw some poor baby elephant walking the streets of Chiang Mai begging. I was appalled. The poor animals clearly looked miserable, they were in danger from cars, their feet would be cut, it was very hard on their joints to be walking the pavements. Also, I read an interesting article that said elephants sense through their feet, the car vibrations and loud noises must have been like torture. These magnificent creatures need our help. The other evening I attempted to walk up Huay Kaew Road. I say attempt because the proliferation of cars parking on the pavements made it nearly impossible to actually walk on the pavements and forced me out into the roads to dodge passing cars. This was not up and down the length of the road but one in front of a language school and another opposite Rincome Market. There were so many cars and trucks parked on the pavements at that point that I had to walk in the road for several hundred metres. A rather frightening experience as the traffic came rushing up behind me. I have attached a photo to show how completely the pavement was blocked. I realize that parking is difficult along this road but surely these people can find a parking place and walk to the market! If someone is injured or killed by a passing car whose fault will it be? The driver who didn’t expect to see a pedestrian? Or the person who felt that it was more important they didn’t have to walk to get where they wanted to go? I really wish the police would do something about this. I can’t say that I have ever seen them do any kind of traffic policing other than helmet checks on the side of the road. They need to get more proactively involved in enforcing laws and regulations and then people may find this city a much safer place. It seems the rainy season has arrived with the rains of the past few days. All well and good, we need the water. However, the potholes that are invisible to us motorcycle riders are still around and quite dangerous in many spots. Perhaps Chiang Mai Mail readers can send in photos of the worst potholes and the exact location to pass on to authorities? Some are very small but deep, deep enough that if the narrow tyres of a motorcycle hit it the rider could easily go tumbling over the handlebars of his (or her!) motorcycle. How do you feel about a pothole catalogue dear editor?